A huge congratulations to Sandra who has been working with Julie at MOTIONrehab Hull. 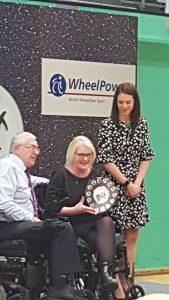 Sandra competed at the Wheelpower Inter Spinal Unit Games 2018 and won Best Female Swimmer by taking first place in her three swimming races, 25m breaststroke, 25m backstroke and 50m front crawl. Sandra also went on to achieve 3rd place at table tennis and 4th place in archery. What an inspiration!